Why are dinosaur fossils relatively easy to find on the Isle of Wight? 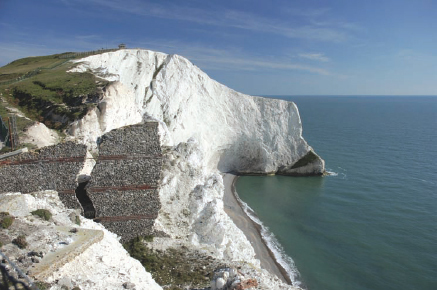 The dinosaur fossils on the Isle of Wight are relatively easy to find because they are concentrated in two small areas. There is a 6-mile-(10-kilometer-) long fossil-containing area along the southern coast of the island, and another half-mile-(0.8-kilometer-) long area on the eastern coast. In many other of the top fossil sites in the world, the bones of dinosaurs are distributed over thousands of square miles, making the search for them more diffuse and difficult. The continual uncovering of dinosaur bones on the Isle of Wight is due to a unique combination of physical factors. The rock containing the dinosaur bones has been pushed to the surface by geological pressures; in other parts of the world, this type of rock may be buried underground—sometimes by as much as 1,000 feet (305 meters) below the surface. The fossil-bearing rock itself is a soft rock, consisting mainly of sandstones and mudstones, which makes the rock susceptible to erosion. And the Isle of Wight experiences extensive erosion. More than three feet (one meter) of rock is worn away every year in certain exposed areas. The engine for this high rate of erosion is the sea. Every fall and winter, the flow of the tides, combined with high seas and gales from the English Channel, batter the rocks that make up the sea cliffs on the island. But this has been a boon to scientists: the erosion exposes dinosaur bones, which literally fall onto the beaches at the feet of eagerly awaiting paleontologists. Among the many exciting finds on the Isle of Wight are: the skeleton of the first small, meat-eating dinosaur found in England, a new species, was found in a crumbling cliff by an amateur collector; in 1997, a smaller version of a Tyrannosaurus rex, another new species called Neovenator salerii, was also discovered; and a very well preserved Iguanodon was uncovered. The fossil remains of a 12-foot (4-meter) carnivorous dinosaur were discovered—a cat-like creature, with unusually long hind legs that permitted it to run at high speeds; it was also equipped with claws and razor-sharp teeth and became the first small meat-eating dinosaur found in Britain. Two factors make dinosaur fossil hunting on England’s Isle of Wight rather easy: the fossils are concentrated in two small areas, and the island is made up of soft rock that is easy to excavate, such as the chalk on these cliff faces (iStock).